Alex J. Murphy was a normal cop in Old Detroit when he was mortally wounded and reborn as RoboCop. "The Man Behind the Machine"
cop to die there. When a company named Omni Consumer Products came in trying to clean up the city. They want to make Detroit into Delta City. Where there is no crime or anything wrong. They want to replace cops with machines with heavy weapons. When they brought in an android called ED-209 it still had a glitch and shot a man and killed him. That's when a man named Bob Morton stepped in and showed them the Robocop project. They gave it a thumbs up but, it still needed a human host. After a cop named Alex J. Murphy was killed after chasing a gang ran by Clarence J. Boddicker there was an opening. Alex killed two of his men before he is shot to death. Alex was said to be dead in the hospital. That's when a group of scientists started to work on his body to create a human cyborg cop. After the added the cyborg attachments he was finally online and working. Alex would travel the city looking for crime that he could give justice. His methods were on the line of police brutality. Alex does anything and will hurt anyone in his way of protecting the innocent. window to his death. Alex is then a big man in the police force. He still has to deal with being a cyborg, but he smiles in the end. outside. Then a replica of RoboCop blasts in space and escapes. The Auto-9 is a powerful hand gun which is stored on a mechanical bracket in RoboCop's right leg. This weapon fires three round bursts. Clips of ammunition are stored in the right wrist of RoboCop's armor. 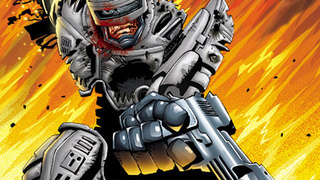 RoboCop's left hand is also removable and can be replaced with a Gatling gun as shown in Frank Miller's RoboCop, and in the film Robocop 3, although in the film it resembles more of a futuristic assault rifle than a Gatling gun. 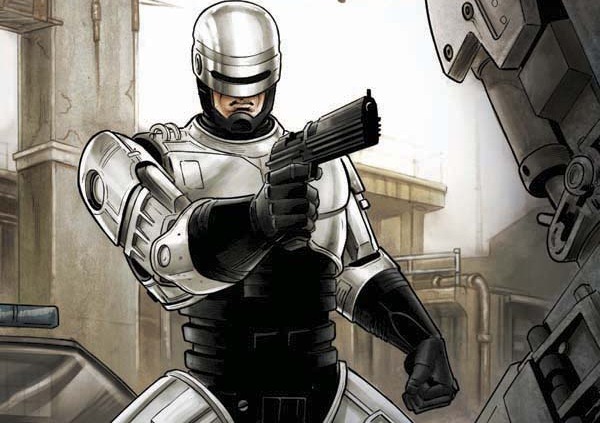 RoboCop also has what is referred to by fans as a "dataspike" a computer terminal accessing device that resembles a long metallic spike that is occasionally used as a impromptu melee weapon.